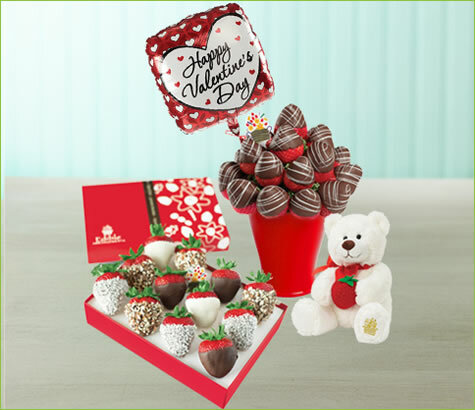 These bundles are sure to touch the hearts of your loved ones! Please select delivery area and date to begin. Pick an area, date and service to view serving stores..
Add the best dipped fruit, Period. Want to sweeten it up a little? Choose to dip one or more of the types of fruit already in your arrangement. Or add a different variety of dipped fruit just to mix it up. Add a touch of personality. Would you like to add a touch of your personality by adding the personalized items with your arrangement! Please remember to include your name. The card message is the only way for the recipient to know who sent this gift. Card will not be enclosed in an envelope. Please select an area to continue shopping. InvalidProvince. Click here to find aProvince. This area is currently not serviced by Edible Arrangements. as a store opens in your area. Click here to learn about franchise opportunities in your area. The province you entered is associated with a P.O. Box. Please enter a province associated with a Home or Business address for delivery. The flex option allows customers to save money around busy holiday seasons by selecting a different or flexible delivery date for their recipient. This option is great for customers who want to save money on their delivery fee by not having their product delivered during peak times. Please resolve the following discrepancies to proceed.